Point Pleasant class of 2018 graduate Kelsie Byus awaits a pitch during the second inning of the West Virginia North-South softball all-star game on Thursday at the Buffalo High School Softball Complex in Putnam County. BUFFALO, W. Va. — A final day in the sun as a Lady Knight. 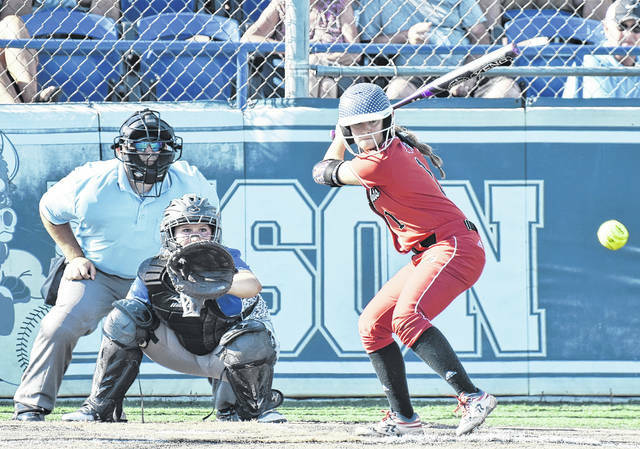 Recent Point Pleasant graduate Kelsie Byus had one final opportunity to take to the diamond in the Red and Black while helping the South All-Stars claim a three-game sweep over the North All-Stars on Thursday at the Buffalo High School Softball Complex in Putnam County. The day began at 10:30 with seven skills competitions, followed by two seven-inning games and one five-inning game. Following the finale, Byus spoke about the experience. This season, Byus helped guide the Lady Knights to a 19-8 record and was a special honorable mention team All-State Class AA selection. Byus — who played in all three games of all-star festivities — competed in the home run derby and earned a second place finish in the bunting competition with a score of 29 points. Hurricane’s Jayme Bailey won the bunting competition with 31, while Hoover’s Kirsten Belcher won the home run derby who hit six. Ripley’s Paige Swisher won the 20-yard dash with an average time of 2.91 seconds and a top time of 2.89 seconds, and also won the 40-yard dash with an average time of 5.91 seconds and a top-time of 5.82 seconds. The fastest throw underhand competition was won by Madonna’s Katie Gasvoda with an average and top-speed of 60 mph. Brooke Clark of Shady Spring captured first in the fastest overhand throw event with an average speed of 67 mph and top-speed of 70 mph. Grace Hefner of Braxton placed first overall in the accuracy throw to conclude the winners of the skills competition events. In the opening game, the South All-Stars broke a scoreless tie with one run in the top of the second inning, and added an additional run in the top of the third. The South extended its advantage to 4-0 in the fourth, manufacturing two runs on two hits, one walk and a sacrifice bunt. The South tacked on an additional run in the fifth, as a one-out RBI single by Byus increased the lead to 5-0. Both teams scored one run in the sixth inning, as the South closed out a 6-1 win. The first game’s Most Valuable Players were Kacee Roberts (Parkersburg) for the North and Bailey —who was 3-for-4 with two doubles and a home run — for the South. In the second game, the South took a 1-0 lead in the top of the first inning, and added four additional runs in the third to take an early 5-0 advantage. The North cut the deficit to 5-1 in the bottom of the fourth, as Oliva Mace (Roane County) led off the inning with a walk and later scored on a one-out single by Gasvoda. The South extended its lead to 10-1 in the top of the fifth, manufacturing five runs on four hits, one hit by pitch and a North fielding miscue. The North were held scoreless in the bottom of the fifth, as the South closed out the nine-run victory in mercy-rule fashion. The Most Valuable Players in the second contest were Buffalo’s Kaitlynn Rasnake from the South and Gasvoda for the North. Rasnake had two safeties and three RBI, while Gasvoda had a hit and drove in one run in the setback. In the third game, the North took a 2-0 lead in the top of the third inning as Roberts lifted a two-run home run over the fence. The South rallied in the the bottom of the third, manufacturing four runs on three hits, one walk and an error to take a 4-2 lead. In the bottom of the fourth, Bailey provided her second home run of the day, driving in two runs, while Jordan Bell (George Washington) added a two-out RBI-double to extend the South’s advantage to 7-2 entering the finale. The North were held scored in the top of the fifth and final inning, as the South closed out the five-run victory. Roberts was the MVP for the North in the final game. while Champmanville’s Kenzi McCann was the South MVP. The South has now won 19 of the last 22 meetings and hold a 41-22-1 record in the series, which dates back to 1993.